Simply by ceasing to breed, Volunteers and Supporters set a good example for others in whatever society we inhabit. Being the change we want to see in the world may be our most influential method of helping others achieve a greater awareness. For many potential Volunteers, this is enough help, so never under-estimate your passive influence. Many of us, however, want to be more active in spreading the meme of voluntary human extinction. The following advice comes from my experience encouraging voluntary human extinction over the past 40 years. It’s not finished but then neither am I. If you have advice to share, please send it to me and I’ll see if I can fit it in here. I start by assuming everyone is either already a Volunteer or is a potential Volunteer. Although it’s important to reach people before they start repeating themselves, society as a whole is just as important. Social attitudes are shaped by people of all ages. I don’t try to win a debate about VHEMT. Winning requires a loser and no one wants to be a loser. Our success depends on everyone being a winner. A respectful presentation of the VHEMT concept doesn’t set up a debate or argument. Naturally, situations with debate as the ground rules are exceptions, and some folks just love a good argument. We males often require more effort to avoid a dominating approach, and a male prospect is more likely to feel dominated by losing an argument. Maintain a positive attitude. A negative attitude does more harm to the cause than is good for it. It’ll wear us down as well. This is going to take our entire lifetime and then some. If someone won’t accept the fact that Earth will be healthier without humans and that we should stop breeding, perhaps their children will understand. It helps me continue sharing the meme to think of it as a process rather than a goal. We are planting seeds which may grow in fertile minds, and we aren’t likely to see the fruits of our labor. First, get to know the person you want to help progress. We must be able to see things their way before we can help them see things in a new way. People won’t accept an idea that doesn’t somehow fit their existing worldview. Beliefs: How invested in their belief system are they? Identity: Do they label themselves as a member of a group or adherent to a belief system? Self-concept: Will they feel personally threatened by a new idea? Negative concepts: Are they strongly opposed to anything? Stay clear of those things if so. Emotional triggers: What gets a rise out of them? Avoid or use very carefully. Vocabulary: Use terms as your friend defines them. Concepts that agree with VHEMT: Make connections with them when appropriate. During this “interview stage" we may be given opportunities to explain the VHEMT concept. A quick phrase that sums things up might be all we have a chance to say. We needn’t hurry: this can take years. Determine how much your potential Volunteer is ready to think about. For some, an explanation of the goal of preserving life on Earth might be the limit for a first exposure. Others can handle the whole concept and add to it for good measure. You’ll have another chance if you don’t go far enough, but if you go too far it may be the last time they listen. Someone firmly in denial will be less receptive than someone angry about the state of the world. We should adjust our approach to fit. Use whatever presentation style you’re comfortable with. We’re more effective matching the approach to fit our prospect, but if it feels better, just be yourself. A humorous approach runs the risk that you won’t be taken seriously, but it’s generally less threatening and can avoid negative feelings. An intellectual approach bores some, but adds credibility for others. A logical approach is the only one some people will recognize. The concept only requires a few steps of logic, so keep it simple. If logic appeals to your prospective Volunteer but not to you, just share the concept and they can take it from there. A philosophical or theoretical approach avoids deciding whether VHEMT could actually succeed or not. The question is, should it succeed? As unlikely as voluntary human extinction is, we necessarily include this approach to some degree. A moralistic approach is dangerous because it’s hard not to sound judgmental. Even though preserving life on Earth is basically a moral issue, use caution in mentioning this aspect. The effectiveness of a personal approach depends on which person we are being personal about: us or them. It’s fine to use our own life as an example for discussion, but it’s safer to let others make applications to their own lives. The shock approach is a good way to nowhere fast. If they haven’t heard environmental horror stories before, they won’t hear ours either. Emphasize the positive aspects of phasing ourselves out. An argumentative approach could be preferred by your prospective Volunteer. If you’re also up for it, have fun with it. Defending the ideas of others. In trying to relate to VHEMT, some will search their memory for a similar idea and try to make it fit. Voluntary human extinction, if it has been advocated in the past has never been tried that we know of. Conditions have never been like they are now. This is a new solution for a new situation. Rejecting the ideas of others. Be respectful of any idea your prospect presents. Everyone likes to think they are right. If you try to prove them wrong, they will usually reject your idea and entrench against it. Proving someone wrong is pointless anyway. Simply present the concept and allow others to test it out from the security of their current beliefs. Fault-finding and finger-pointing are ways of shifting responsibility onto someone else. VHEMT is pro, not anti. There are no enemies of The Movement. There are simply those who haven’t progressed along their Path of Awareness to phase seven. They need guidance, not indictment. Allow prospective Volunteers to express their ideas at length. Often they are working it all out themselves and this is part of the process. However, unless you have lots of time and enjoy the mental exercise, don’t get mired in historical, religious, philosophical, political, or economic theories. The concept is simple. Academic discussions too often avoid dealing with basic concepts. Steer the conversation back to the larger view when possible. If they ask and you have an answer, tell them. However, statistics are slippery and often inaccurate. People usually want statistics to support their beliefs after they’ve decided rather than for use in making up their minds. If someone objects to a statistic we offer, admit that there’s a margin of error and graciously offer to accept their statistics. Most of the time, it doesn’t matter whose data we use. This is just fancy name-calling. It’s usually used to decide which waste basket to file an idea in. VHEMT stands on its own: preconceptions need not apply. Allow that it may seem like VHEMT fits that model, however... and then state whatever the difference is. Trying to have an answer for every question. VHEMT opens up a whole new range of questions. Encouraging others to come up with their own answers, or thinking of an answer together, helps them gain the new perspective in a more meaningful and memorable manner. Caskie Stinnett said, “A diplomat is a person who can tell you to go to hell in such a way that you actually look forward to the trip.” We’re not wishing humanity would go to hell, just go extinct. With diplomacy, we might explain phasing ourselves out in such a way that they’ll look forward to going too. Choosing words which convey what we mean allows others to think more clearly about our message. Many terms have become loaded with misconceptions and emotional baggage. Terms often have the same meaning but different connotations. “Birth control” and “contraceptives,” for example. We may as well choose the one with less subconscious negativity. I reject “population control” for that reason. "Population control" is what we have now—we need reproductive freedom. Instead of saying, “having children” or “having a baby,” I use “creating another of us,” “creating another human,” and so on. Babies and children have emotional connotations, and I want to emphasize the fact that we’re not just making babies, we’re making adults. There are times, however, that the emotional appeal of “children” is useful. Discussing the VHEMT concept online gives us time to think between comments, and perhaps more importantly, to calm down. People write the darnedest things online and can even be insulting. It never pays to fight fire with fire. What we write isn’t just for the people we are replying to: others are reading the exchange. They are usually more likely to gain a new insight than someone on the attack is. When we are patiently polite regardless of their rudeness, our perspective gains credence. When sharing the concept on forums which are obviously at odds with VHEMT, it’s all the more important to be courteous. For example, the Catholic Answers forum from December 2006. A lengthy example of a particularly challenging discussion from September through October 2010. 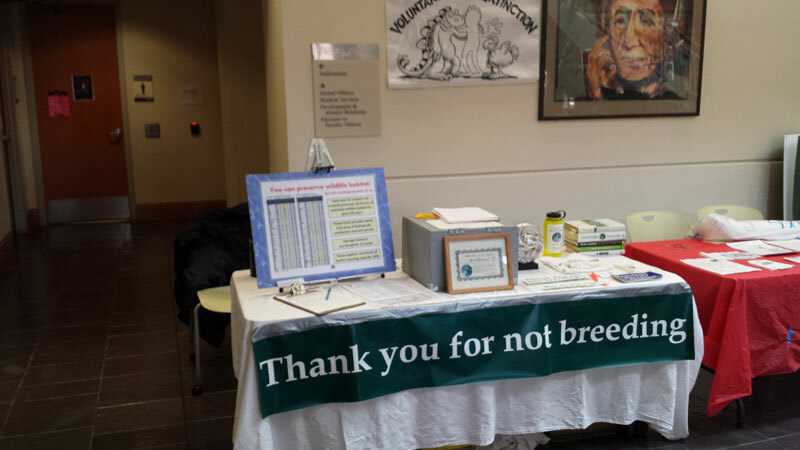 An information table is hosted each year in Knight Hall at the Public Interest Environmental Law Conference, University of Oregon School of Law. 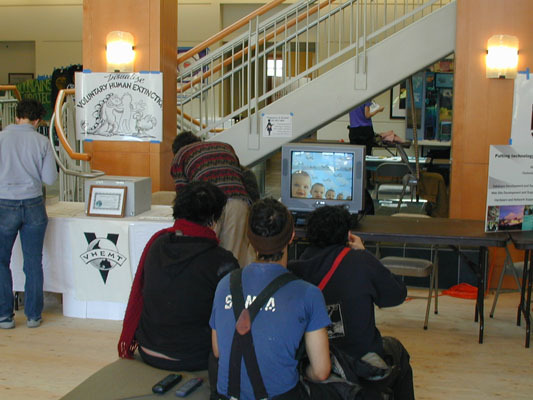 You might have the opportunity to participate in events such as Earth Day, street fairs, or conferences. If you feel this would be fun, contact me for a Booth Kit with an inventory of bumper stickers, buttons, and so on. Or you could just download the “Why Breed?” chart and make lots of copies to share. Graphics may be downloaded and enlarged. You’re completely autonomous in what you do as a Volunteer in the Voluntary Human Extinction Movement. There’s no hierarchy giving orders. 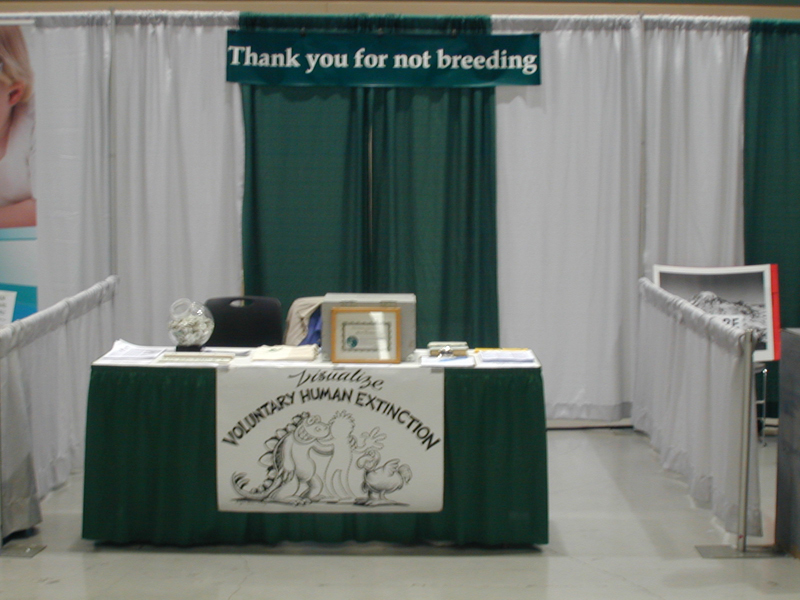 Since the name says it all, it would be hard to promote voluntary human extinction inaccurately. There is a possibility of Volunteers approaching others impolitely, but that couldn’t be prevented by the dictates of a world headquarters anyway. A sense of humor seems to be one of the hallmarks of VHEMT Volunteers, so I don’t think we have to worry much about loose cannons in The Movement. How serious can we be when our goal is this outrageous? Attitude counts. This should be fun. If it’s not fun, stop it. People can subconsciously sense your fun attitude, or lack of it, from a distance in a fraction of a second. In conversation, our tone of voice might be more important than the words we choose. The customer is always right, especially when they’re wrong. When people hold misconceptions to be true, they don’t want anyone pointing it out. Some actually prefer to walk around with their head in the sand. Respectfully presenting an alternative view without disrespecting theirs gives them the opportunity to consider it. Some return to the booth for more information. Thoughtful disagreement with VHEMT is better for awareness in the long run than mindless agreement. Studies show that we are highly resistant to admitting we are wrong. The stronger our beliefs, the less likely we’ll be influenced by facts to the contrary. Most of us actually cling more strongly to an incorrect idea when it’s shown to be wrong. Mistakes Were Made (But Not by Me): Why We Justify Foolish Beliefs, Bad Decisions, and Hurtful Acts by social psychologists Elliot Aronson and Carol Tavris explains this tendency in depth. Challenging beliefs makes them stronger and more likely to be proselized. With this in mind, if someone claims, for example, that human population is declining, just sticking a graph in their face showing it increasing won’t change their mind. In this case, I use the three charts from the Demography page to show that they are indeed correct: world population growth rate is declining, what’s more they’re right again in the second chart showing the amount of growth each year is declining. If I could find a chart showing fertility rates dropping, they would feel right again. When I show the third one of our density steadily growing, they might not fully accept it, but at least they can feel right two out of three times, and not entirely wrong about anything. How could we possibly influence someone depicted in Nina Paley’s cartoon above? Tell them babies are, statistically speaking, ugly? As with any emotionally-based, firmly-held belief, agreement is our only window of opportunity. If we really do find babies to be ugly, we can at least acknowledge that many others think they're cute as well. With a foot in the door of their worldview, we can make a pitch, so to speak. “Yes, and there are so many that need loving homes, too. Ever thought about adoption?” “Trouble is, they’re only babies for a short time. Seems like someone who loves babies would be fantastic at day care.” And so on. At the risk of being pedantic, it’s like taking a toy away from a child: we have to replace it with something at least as fun and ideally, more fun. In any case, try to see things their way if they’re willing to explain it. Give a respectful ear. Maybe ask for clarifications. Never win. Potential Volunteers will forget VHEMT as soon as possible if they feel they’ve lost a debate. Allow them to win and they’ll not only remember, they’ll tell others about it—perhaps giving VHEMT credence to make the victory sweeter, and the meme will be spread. Be sensitive. Parents with children and those visibly expecting may come by and wonder. Welcome them. It’s never too late to become a Volunteer, and we have no enemies. The idea is to breed no more than we already have. Many Volunteers are parents. I’ve had complete agreement from visitors carrying babies—at least one of which I’ve held while mom perused the literature. If they won’t accept that we should become extinct, perhaps they’ll agree that we should have a moratorium on birthing until things get turned around. If that’s too much, try the idea of improving birth rates. Almost all will agree the freedom to not breed is a basic human right. Somewhere along the line it’s best if we can agree on something. There has to be an agreement to act as a foundation for the discussion. Once we’re standing on common ground, we can point in the direction we hope they head. “Have you ever heard of the voluntary human extinction movement?” Speak clearly because many will not understand what you said, especially the “ex-tink-shun” part. Pause. If they look puzzled but ask no question, I follow with, “It hasn’t really caught on... maybe we’re doing something wrong.” Presenting new ideas in a light mood makes them easier to accept. It helps to have prospective Volunteers involved in meaningful way, and asking their opinion is a good one. Let ‘em talk. Some will say the strangest things. We seem to be triggering something deep in the subconscious. Don’t take it too seriously, and be respectful of their right to be idiots. They might begin to hear themselves and grow in awareness right before our ears. Often their ears close until their tape has played clear through, so it’s useless to try to interrupt. Just listen. If they go on and on while you lose prospects, try giving them a nod and then looking at an interested party while saying, “Have you heard of....” We can’t let people render us ineffective by pinning our ears down with mindless dribble. They’ll soon find another victim. Our words are translated into electrical impulses which have to arrive at the right location in their brains to have any real effect. Channels can be switched in the blink of an eye when they don’t like the show. Then all those little pearls of wisdom surfing in on the brain waves never make it to the beach... the tube closes out. If what we say isn’t going to get there, it’s better not said. Listening attentively to what others have to say will improve their reception to what we have to say. If we’re talking more than they are, it’s possible we’re overloading their circuits. Sometimes we can tell when someone’s receivers have shut down: their eyes change focus, a facade of attention hides their mental escape, with nodding, humming uh-huhs. Often, people only appear to be listening—they’re thinking about the next thing they’re going to say and are waiting for a pause. When someone speaks immediately after we’ve made a point, without time to digest it, they likely didn’t hear it. If their comment only loosely relates to our point, they’re still in broadcast mode and aren’t ready to receive. After a few hours at the table, we might have had more social contact than our visitor has had in a week. Some aren’t adept at social interactions in the first place. Don’t take what they say and how they say it too personally. 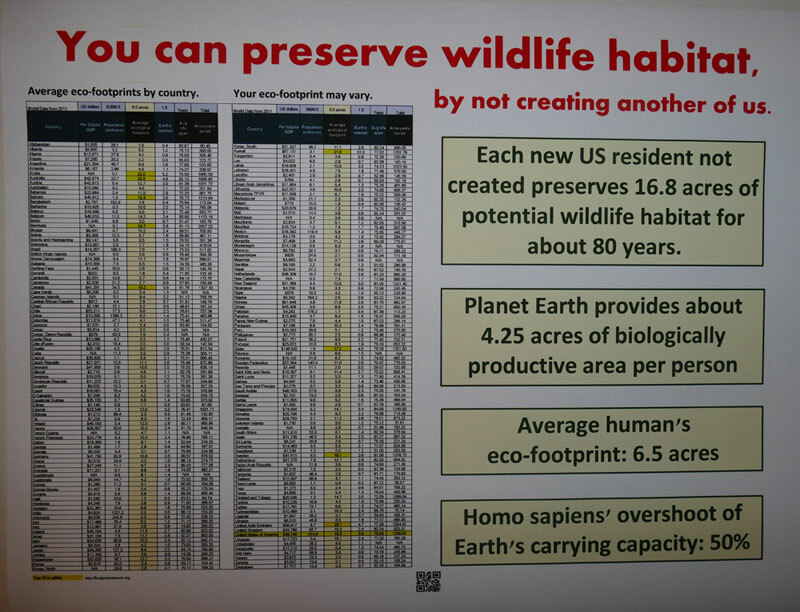 One positive spin on the fact that we have a large ecological footprint is that we’re able to preserve all the more habitat by not breeding. I printed a modified excel spreadsheet of the ecological footprint for nations. They no longer offer the chart in acres, just hectares, which has to be multiplied by 2.47 for a US audience. An acre is slightly less than a football field. 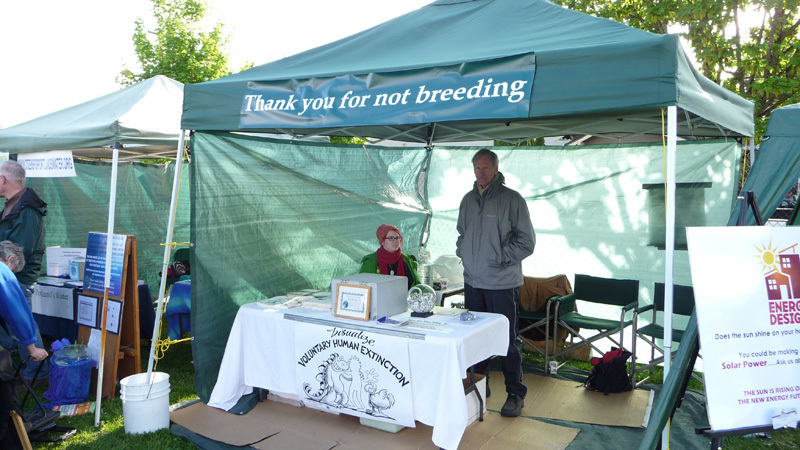 A clipboard with the non-procreation affirmation petition (pdf) provides something physical for people to do. Attach a pencil or pen with a string. One of the most common, and disturbing, perspectives presented by visitors is that the wrong people are having the most children. The movie “Idiocracy” reinforced this. They express it in thinly veiled classism, racism, elitism, and at the root, eugenics. Pointing out this fact sidetracks the discussion at best, and easily degenerates into heated arguments. “Those women on welfare are having more kids just to get more money.” (This myth may never die). “You’re right, their birth rates are much higher than ours, but our environmental impact is many times what theirs is.” Ecological footprint chart. “Oooo, might have to file an environmental impact statement these days.” Tell this one like a joke or don’t say it. A frown at the booth display by a passer-by. Walk through the line of tables or booths and see what catches your eye. 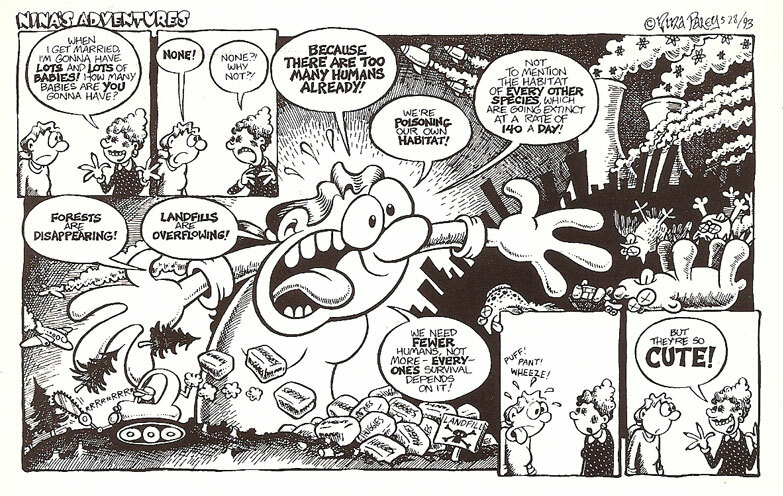 I enlarged Nina Paley’s “Visualize Voluntary Human Extinction” cartoon, laminated it, and try to display it prominently—ideally above and behind me, but it also works in front of the table. The dinosaur and dodo are smiling even when I’m not. Make it inviting. Perhaps turn table sideways and invite people into booth or back table area. Many decisions are best made on site. In the planning stage, options are more important than decisions. When setting up, sometimes any decision is better than no decision. Clear plastic sheet over table if raining. Towel. Layers of cardboard provide cushion for feet on hard surface. Take a copy of your booth/table confirmation in case of glitches.